Let me start by acknowledging that Twitter looks useful. I remain one of those who don't get it (I tried), but there are many other things I don't quite understand and in most cases my ignorance is due to my own limitations. So, Twitter, it's not you, it's me. A few things have been bugging me about you ever since we met -- readers are not sheep to be called followers -- but really, you are cool. We'll remain polite to each other even if entrenched in our respective worldviews. Who knows, maybe we'll do business together one day. What I can't explain -- nor calmly bear -- is the nauseating giddiness that's been bubbling in my RSS reader for the past year. Everywhere I clicked, it's been twitter this, twitter that. High-school dramas over who tweeted what to whom. (Speaking of 2.0 dramas, here's a great collection.) It was amusing for a couple of months, after which I hoped the spotlight would turn away. It never did, so I thought I'd do something about it myself. 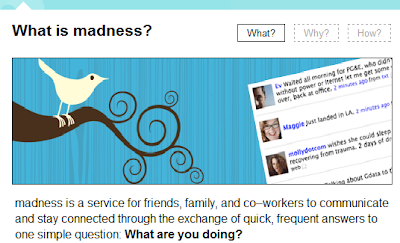 Now, everywhere I browse, the words "twitter" and its derivatives are replaced with what the whole thing really is - "madness". All it took was a Greasemonkey Firefox extension and a slightly tweaked profanity filter. It's like one moment you have hundreds of canaries in your room, and then suddenly someone turns them all off. It's quieter, and everything makes a lot more sense, too. 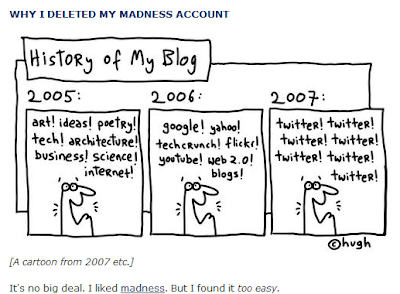 The followers of GapingVoid's author mourned his departure from madness in some 150 comments. Very interesting post. Seem in the age of so much information it gets really noisy with overload and irrelevant content. I use twitter but prefer to be followed as oppose to following. amen. twitter appeals to the 5% of the population who create online media and nobody else. Twitter works for me because a community of people I want to follow are on twitter. We share links, joke around, discuss things - it's like a virtual chat room at times. It becomes a problem when that community grows too big. You initially connect with a few people whom you'd like to connect with most. As you add more and more people, the community becomes too large, and the noise quotient increases. At the same time, if you follow more people than you can manage, you're at fault. That's true with most social networks, and for me, Twitter is another social network.